Finalists for RWA's RITA and Golden Heart awards were named today. 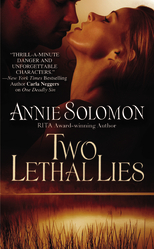 Congratulations to author, fellow MCRW member, and friend Annie Solomon, a finalist for the 2011 Romantic Suspense RITA for Two Lethal Lies. Congratulations to Annie! May you soon have a second RITA gracing your shelf!